Unlike other aluminum sleeves, these are slit and expanded so they can be pushed into place by hand and have just the right tension so they stay located at the top of the slider without moving. The top sleeve covers up the large oil bleed hole in the fork tube when it nears full extension, thus creating a hydraulic bump stop to eliminate the harsh metallic “clunking” sound of Norton forks. Will not restrict fork travel. 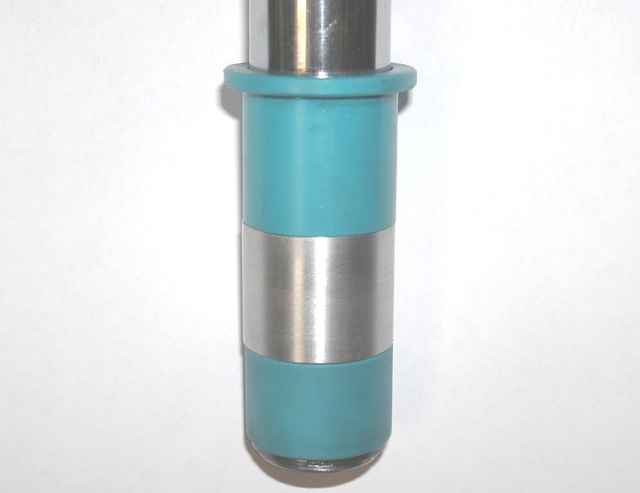 Special short 1/8″ plugs (not shown) are provided for blanking off the oil escape hole at the bottom of the fork tubes just above the lower bushing in order to make this kit really work. The bottom sleeves fit over the bottom of the damper tubes to cover the oil bleed holes below the conical section. Then a single 1/16″ hole is drilled in the conical section or just above the conical section to create a hydraulic bump stop to prevent metal to metal bottoming. The single 1/16″ hole will also give you some compression damping. If you already have large 1/4″ holes in the conical section then you will not have any compression damping. For compression damping and additional upgrades (see Fork upgrades).